The hint video from the Tip Network at Bowser Jr.'s Fiery Flotilla. The Tip Networks are a type of object in Super Mario Galaxy 2. Tip Networks are mounted on a green and yellow signboard-like post. They provide helpful tips for the player for upcoming obstacles or challenges that lie ahead. Mario needs to stand in front of the Tip Network to activate it. The TV shows a quick demonstration of how to surpass a difficult part of the galaxy. Unlike the Cosmic Spirit, it does not degrade the Power Star to a Bronze Star. The Tip Networks play a similar role to the Hint Movies in Princess Peach's Castle in New Super Mario Bros. Wii, except that it does not cost the player anything. If playing as Luigi, they do not appear. After the Tip Network finishes showing the player how to overcome obstacles, the entire level is reset to the way it was with all of the enemies returned as if they haven't been defeated yet even when the player already has. Plus, the Star Bits and Coins come back as well. It is shown that the player can obtain 999 Coins and 999 Star Bits as demonstrated in Fluffy Bluff Galaxy. 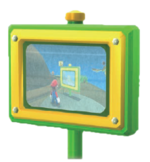 If the player looks directly at the Tip Network sign through Mario's view, they will see what appears to be an infinite mirror effect of the Tip Network screen, as the screen on the Tip Network sign displays whatever is currently on the game screen. This page was last edited on August 8, 2018, at 09:46.